In Education in the Free Market Spunky makes the point that "The public schools don't function like the rest of the free market so they will never see the parent as the consumer." Parents don't have choices on which public school to send their children to, and if they want to shop somewhere else, the government still takes their money. "Any other business that did this would be called a thief or an extortionist." Can you imagine being told that you had to buy your food at a certain store? Or even worse, if the store you had to shop at got to pick what they sold you? The Thinking Mother writes about a New Free Online Homeschooling Magazine and a Tween Magazine, Too. If you wanted to write for a new market you might want to check out these two magazines: HS Highlights and Tween Mag. Susan of Corn and Oil found an interesting response from public schools to losing students in Teacher Home Visits for Bounty (goodies in the classroom). Rather than work on improving the school, the administrators are giving teachers a reward for talking parents into sending their children back to public school. In Guilt-Free Homeschooling Carolyn explains how to Redeem a Disaster Day. We all have bad days. Carolyn explores how to minimize the negatives and accentuate the positive. One of the few reminding criticisms of homeschooling is that the parents can't be "qualified." But after I read articles like Andrew Wolf's Why We're Losing Ground I think to myself most people don't know what they are talking about. He talks about some of the tests public schools teachers have to take, but that so few teachers can pass. Yesterday, I had a post about a school that banned a second grader's service dog, and how many of the comments on the original article turned to homeschooling. Well, this is how the story ends. SCITUATE - The debate over whether an 8-year-old girl with a rare bone disease can bring her service dog to school has ended. That’s because Hailey Manduca won’t be attending second grade in Scituate schools when classes start next week. Her parents, Cheryl and Richard Manduca, have decided to home-school Hailey, her mother said yesterday. ‘‘Home-schooling I think will be the safest - best for Hailey,’’ Cheryl Manduca said. Hailey has osteogenesis imperfecta, a rare bone disease often called ‘‘brittle bone’’ disorder. She’s broken nearly 60 bones. Doctors want her to use a service dog to help with balance and stairs. Scituate schools had banned Hailey’s dog, named Independence, saying it barked and growled at students and teachers during training sessions last year. The Manducas were in mediation with the schools this summer, and, earlier this month, they filed a complaint with the Massachusetts Commission Against Discrimination to try to force the schools to let the dog come to school. Scituate Superintendent Mark Mason said the school department is working with the family on the curriculum and assessment methods that will be used at home with Hailey. Does this mean she is a public school student at home? Families are permitted to home-school children in cooperation with public schools. In Scituate, Assistant Superintendent James Kelleher, who is in charge of curriculum, handles the requests, works with families on curriculum and monitors students’ progress, Mason said. Mason said he hopes the situation will spur the Legislature to review state law on the use of service dogs at schools to avoid a future contentious situation between a school and a family. He said school officials weren’t strictly opposed to the dog, but they needed to be sure having Independence at school was in the best interest of Hailey and the school. ‘‘We wish them the best and extend the opportunity to work with them, not only now, but throughout the year if they need advice,’’ he said. Cheryl Manduca has a degree from Quincy College, and taught older preschoolers until she became disabled in 2001. Cheryl Manduca also has osteogenesis imperfecta, but Hailey’s symptoms are more sever. Home-schooling will mean that Hailey won’t miss so much school because of doctor’s appointments and surgeries - she’s had nine surgeries to implant metal rods alongside her bones to make them more stable, Manduca said. She said that the family already has a schedule for Hailey worked out for class time from 8:30 a.m. to 3 p.m., including basics like math, reading and writing, all the way to art, music and gym class. I wonder how long they will try to do "school at home" in contrast to "homeschooling?" They plan to use curriculum and teaching material from Christian Liberty Academy, a home-school program based in Illinois. When Hailey graduates from eighth grade and twelfth grade, she can walk across the stage with all the other graduates, and will receive a diploma as opposed to a GED, Manduca said. Does this mean she is a private schooler at home? Whose stage will she walk across? Christian Liberty Academy or the local government school? ‘‘We fully researched this before deciding this was what we wanted to do,’’ she said. For now, the Manducas plan to keep their other two children in Scituate schools. Manduca isn’t worried that Hailey will have less social contact with classmates. She’ll continue in Girl Scouts and catechism through her church, and she’s on the waiting list for a chorus with other home-schooled kids in Worcester. The Manducas also have found a Duxbury-based support group for home-school families. They planned to attend a meeting last night. The group gets together for field trips and other activities. Three other Scituate families who home-school their children belong to the group, Manduca said. ‘‘Hailey might be able to make some new friends tonight,’’ she said. After some recent discussions about the term "homeschool," I was wondering is it still homeschooling if the child is considered as a student in a private school, but doing work at home? We do use a private school for some course work, but our child is legally considered at student at our private school, Cate Academy. The private school that sends us DVD's of their classroom lectures does not issue grades, provide a transcript, or accreditation, but we could sign up for those services. We have no interest in those services, but I was wondering, when is a homeschooler not a homeschooler anymore? "You say the little efforts that I make will do no good; that they never will prevail to tip the hovering scale where justice hangs in the balance. I don't think I ever thought they would. But I am prejudiced beyond debate in favor of my right to choose which side shall feel the stubborn ounces of my weight." I think about this now and then as I blog. I don't expect to ever be as big and influential as Instapundit. I do hope that my few ounces have made a difference now and then. That maybe some child is now being homeschooled who otherwise might have been stuck in a horrible public school. And finally today's A Word A Day is palinode, which means: A poem in which the author retracts something said in an earlier poem. 'I'm sorry now I wrote it! Countdown: 5! Assess your starting point! Kim reviews some of the things parents can start doing now. Countdown: 4 Aim for Success! Kim writes about the importance of reviewing your child's interests and having goals. Countdown: 4 1/2 Kim shares some more ideas on how to "impress skeptical college admission boards." Countdown: 3 Acquire Credentials Kim shows how to provide outside verification of your child's capabilities and accomplishments. Countdown: 3 1/2 Kim has some additional ideas on "acquiring transcripts and resume fuel." Countdown: 2 Account Assets Kim shows how important it is to provide a full suite of documentation. Countdown to College Launch 1! And finally Kim walks her readers through the basics of applying for the scholarships. If you have a child thirteen or older it would be worth reviewing Kim's posts. There is a lot of wisdom, proven wisdom, on finding scholarships for your child. I enjoyed Valerie Moon's post Cyber-charter growth and the development of virtual school programs continue. She has a great summary of some of the issues with homeschools, public schools, and just how online schools fit. This post is worth reading. Near the start of the article Valerie has a great point: "People who don’t see the public-school-at-home genie (who is just about completely out of his bottle) as the wave of the future usually have some stake in the effects of in-home education that is legally controlled by public authorities." It is clear that more and more people are trying out homeschooling. Unfortunately more and more people in public schools are organizing to fight homeschooling. Spunky has been blogging about many of the same issues recently. In The Online Charter Homeschool Myth she reminds us that terminology is important; we need to make sure people understand there is a difference between homeschooling and doing public school at home via an online charter school. In This Should Settle It Spunky reports that even the public school system sees children using online charter schools as public school students. And yesterday Spunky reported on Homeschooling in Germany as a warning what increasing government involvement in homeschooling might lead to. I agree with Valerie, Spunky, and others. We need to be careful that the public doesn't confuse homeschooling with online public schools at home. One main reason for the huge decline in education at public schools has been the increasing government involvement. By educating the public on the difference we may be able to avoid a bigger battle if (or when) the government tries to impose more regulations on homeschoolers. The Headmistress from The Common Room shares a profund thought about how homeschooling parents may be in the best position to help develop the character of their children in Is There a Hole In Your Bucket? She makes a great point. eBay decided not to allow their sellers to sell teacher manuals. The policy was not discussed or announced ahead of time, they just imposed it. (Which is OK for a business, but it may end up being bad business.) Part of the problem is the draconian approach, eBay even canceled items for sale which weren't teacher manuals. The Headmistress provides extensive background in Teacher's Editions Redux on the history and issues. One of the fascinating parts of her post is selections she found on eBay's forums as people tried to explain to eBay why this was a stupid policy. eBay doesn't appear to be listening. My guess is eBay won't change and homeschoolers will move on to other services for buying and selling education related materials. On one of the last occasions he participated in the project, one of his fellow committee members came to the meeting armed for battle. Thin-lipped and stern, she directed the committee to turn to page such and such in the book, where she had spotted an instance of stereotyping. On the guilty page was a photograph of a father holding a baby. G-pa looked blankly at the page, and then asked the woman what was stereotyped about a father holding a baby. In his day, all babies were held by women, so he thought this was a nice improvement. "But," said the thin-lipped, disapproving Committee Woman, "It's a black man, and he's holding a black baby. That's stereotyping"
Patiently G-pa explained why that wasn't stereotyping. Somebody else on the committee gently explained biology, "Every black man I've ever seen fathered black babies." I really wonder about such people. Did she want the picture to be a black man holding a white baby? Or did she want the picture to be a white man holding a black baby? Or a white woman holding a white baby? In almost every case someone would be upset. I check out Frazz, a comic strip, pretty much every day. A friend who introduced me to Frazz said Frazz reminded him of Calvin, from Calvin and Hobbes. Frazz is quirky, but not near as zanny as Calvin. Frazz works at an elementry school as the janitor. This week's strips have been about going back to school. It started off with a student appealing to Frazz to postpone the start of school. The next day we found out how one student sees public schools, like being eaten by a shark. Today's stip was the best. The same student proposes making school more palatable by having a lunch box with a distracting sound system. If you enjoyed Calvin and Hobbes you might give Frazz a try. While "googling" for something else, I came across this article. While I was not very interested in the original news story on The Obscure Store and Reading Room, many of the comments turned to homeschooling. So here's the article and the "homeschooling" comments. (I must say the site is a bit odd, made up of odd, gory, and sad news stories). So homeschool the kid, problem solved. I understand the desire for parents to give their kids a "regular" childhood, but also know the implications. with a treatable learning disorder, eg a malfunctioning brain. I had two options: medicate, or take her home. I chose medicaiton, and I also persued therapies that has kept her need for bigger doses down and she takes less than half the dose than other kids her weight. Her problem is not health-threatening. On the other hand, my friend's boy has cerebral palsy, leaving him with weak muscle tone in his legs and arms. He has an unsteady walk, and since he's nearly 6 feet tall at age 15, getting hit on the back would paralyze him. So, no matter how much he pleads to "be like everyone else" and take gym class, she won't let him. It's for his own safety. With brittle bone disease, homeschool is the best option. I would worry over every stair, every bumped knuckle, every clumsy Claude. Consider how crappy a kid would feel if they accidently knocked the girl down and broke something? There are homeschool clubs in a lot of communities these days, which allow children to socialize. Sure, it's not a regular childhood, but I feel it's one that puts everyone's best interests into the frame. To say the child could be homeschooled is not a fair solution. What if your child had ADHD and constantly interrupted the class? Would he be sent home permanently to be homeschooled? I say get the dog additional socialization training. Barking is VERY easy to fix. It's not like the dog had bitten people or anything. The poor child has *no* friends. Her dog is her only companion. Plus, he helps her navigate the school and stay safe. I don't get why I am the only one sympathisizing with this girl. If you read my earlier post, it was about my child who was diagnosed with ADHD. I just didn't think I needed to broadcast it so plainly. We were told to medicate or homeschool permanently. We chose medication and "deschooling therapy," which isn't anything like it sounds, but it worked for us. Either way, certain situations just call for parents to back off the regular kid routine. As the mother of a special needs child (autism) and parent advocate, who also happens to live in Massachusetts, I am appalled, though certainly not surprised, by the acts of the Scituate school district. It is not just a matter of a the parents wanting their daughter to have a "normal childhood," it is their right. If it were up to school districts, almost every child with any kind of disability would be banned from school. Fortunately, their is a law that protects their (the children) and our (the parents) rights; IDEA - the Individuals with Disabilities Education Act. Then there are the Massachusetts Dept of Education regulations, the oldest in the nation, that support the inclusion of disabled children. These pieces of legislation state that only the most severly disabled children (not this girl) should be kept from a "mainstream" education. Furthermore, the law mandates that school districts provide for a child's socialization - a large part of the reason for her having her dog - as well as her education. I think this is just another example of a school district attempting to circumvent the law. By the way for all those who suggested it was in "everyone's best interest" for this girl to be homeschooled, I would simply like to point out that the law - IDEA - does not provide for what's in the best interest for "everyone," only what's in the best interest of the child. Rena and Eclecticcalico both make excellent points I had not considered. Certainly, the school environment plays a big role in how well a special-needs child is accommodated, and respected. As a teacher-in-training, I am very aware that teachers receive little or no education in special needs before they get licensed. My point was long-winded but boiled down to this: the child in question is delicate, no one would argue that. Placing her in a classroom with so many rambunctious children, I feel, is placing her in harm's way. My youngest is a recent second-grader. Homeschooling does, unfortunately, move her out of the greater realm of socialization. However, there are many outlets these days for homeschoolers for socializing, and could be done with minimal risk to the girl. The service animal didn't even come into play in my post. Actually, I've known many service animals, and if I made a guess, there were too many kids "rushing" the dog and treating it like a pet, which is a no-no, and THAT is why it may have barked or growled. They're trained to warn of danger, and a bunch of kids running towards the girl and the dog definitely is danger. I'd growl, too. I was home schooled for Jr. and Sr. High. I lived a completely 'normal' life, thank you, and had to turn down socialization options. I am not disabled in anyway, however, I do not feel this takes away from the validity of my point at all. Home school is a completely viable option, especially with schools today in the disarray they are in. No, it's not for everyone, but it is not, and should not be called, abnormal. Also, educationally, home schooling is actually generally better. I know there are exceptions, yes, there are to every 'rule'; but home schoolers are generally under more scrutiny than school children and must take annual tests, etc, to make sure they are on the right level. Many times, home schoolers are above and beyond that. School is fun. But academically, for a student like me, it was not a good place. Home schooling helped to improve my concentration skills (I suspect that I have mild ADD that is now Adult ADD) enough to succeed (when I chose to) in college. School for me was purely social when I was enrolled there. But the topic here is this little girl and her service dog. It is, I believe, against ADA laws to ban her service dog in the first place. Secondly, I agree with (can't find the name now) whoever said that the dog was probably only doing it's job when it was barking, warning the little girl of any percieved danger. And, thirdly, having recieved training in Special Education, I also understand how often the teachers do -not- get the proper teaching, as well. Unfortunately, if one does not go for 'special ed', one does not recieve any training on how to 'deal with' or accommodate appropriately in a way that benefits not only the special needs student, but also the entire classroom. It can be done, but too few teachers know how. I thought it was interesting the when a parent was giving the option to homeschool or drug their child, that they choose to drug the child. So much for a "regular" childhood. If the girl has "no friends," of what benefit is socialization at school? Almost two months ago Isabel Lyman, of The Homeschooling Revolution, announced she was going to be busy getting ready for finals for her law classes. And then at the first of this month she wrote that she was still having trouble getting motivated. She seems to have found her motivation! Over the last week she has been blogging almost every day. Check out the picture she found of a large misspelling. She found the text for an article in Reader's Digest on education which features homeschoolers: How to Raise an A+ Student. I hope her motivation doesn't get lost again. If you haven't read Isabel's blog before, drop by and check it out. Mark Rose is hosting this week's Carnival of Homeschooling at Category Five. For the introduction Mark shares the results of a research project on weather conditions the Cherokee Indians encountered along the Trail of Tears. The latest Carnival of Kid's Comedy is at Life in a shoe. 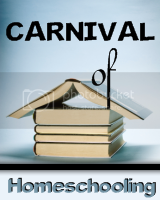 Castle of the Immaculate is hosting the 6th Carnival of Children's Literature. And your children might be interested in the Kid Carnival, posts by children. Judy Aron found Stupid in America at YouTube. "The widely viewed program created quite a stir after it first aired, and Stossel has been heavily criticized by the education establishment for making this program. Pam von Gohren, longtime Minnesota school choice activist and home education pioneer, is among the parents interviewed. She introduces the program theme: American kids aren't stupid; the system is stupid." John Stossel does a good job of details many of the problems with public schools in America. He presents a strong case for public schools in America being broken. If you have not read or watched his report I encourage you to check it out. And you might want to tell your friends and family to watch the report. Gary at HomeSchoolBuzz found a recent John Stossel column: Schools need competition now. Near the end John Stossel says "Some parents choose to homeschool for religious reasons, but homeschooling has been increasing by 10 percent a year because so many parents are just fed up with the government's schools." I enjoyed Brian AtLee's response to recent news about homeschoolers defecting to public schools" in Home schooling remains strong alternative. There have been some homeschoolers who have started using public school online resources. Brian says: "I would be willing to wager there are more students in public schools who are turning to home schooling than there are home-schooled students turning to online curricula with public schools." Bullying is a serious problem in many public schools. Clinton Woman Publishes Book on Bullying is about a mother's successful effort to rescue her son. She took her son out of public school and homeschooled him. Candy Beard, the mother, wrote "Please Don`t Do That; A Story About Bullying in School." I think more parents would yank their children sooner if they realized that homeschooling is very doable. From the Atlanta Journal-Constitution is an article on 2 champs at home school spelling bee. The Discover Mills mall had a spelling contest for homeschoolers. The most interesting thing to me was that the mall has a kids' club with 12,000 members, 3,000 of them are homeschoolers. I'm not sure what this means, or if it means anything at all. The high school class of 2006 recorded the sharpest drop in SAT scores in 31 years, a decline that the exam's owner, the College Board, said was partly due to some students taking the newly lengthened test only once instead of twice. The results come two weeks after it was announced the class of 2006 had posted the biggest score increase in 20 years on the rival ACT exam. The ACT, which is also accepted by almost all colleges that require standardized tests, is generally more focused on material covered in high school classes than the SAT, which is more of a measure of general ability. But more students in traditional SAT states like Connecticut and New Jersey appear to be taking both exams to try to improve their applications to selective colleges. That is very curious. The ACT scores are going up and the SAT scores are going down. Experts say the changeover in exams probably affected how students approached the test, and thus the scores. Students in the class of 2006 had the chance to take both the old SAT exam, until midway through their junior year, and the new SAT after that. If they did well the first time out, some may have opted to stand pat with those scores. Some colleges continued to accept scores from the old test during the bridge period. "When a new test is introduced, students usually vary their test-taking behavior in a variety of ways and this affects scores," College Board President Gaston Caperton said in a news release. I checked out the link to the SAT website. Nation Still "At Risk": Call for a New Compact Between America and Its Teachers, Starting with Immediate Salary Increases. Paying an inadequate teacher more money is not going to improve her performance. However, paying high quality teachers a better salary might keep more of them around longer. As long as teacher contracts are not linked to individual performance, little will change. Either way, this does not address the question of what part the student plays in this equation. Could it be that student performance is falling because students put in less effort than their predecessors? We know that television viewing is at an all time highand reading is at an all time low. Maybe this is the problem. It is just a thought. In the past we've noted a couple tongue-in-cheek posts comparing public schools to prisons. It is starting to look less and less humorous. Some schools in Michigan have decided that Students must wear school ID badges. It would be interesting to know how many high school students feel like they are in a jail. Gerry Garibaldi has a fascinating article on How the Schools Shortchange Boys in the City Journal. (Warning there is a swear word.) He explains that schools are designed to teach girls and thus boys are losing out. For example if you give an assignment girls typically will start the assignment and work on it. In contrast boys will demand to be told the relevance. The schools response is often to move boys to "special ed." Gerry Garibaldi writes about his experience in teaching "special ed" classes. This was scary: "To get into special ed, however, administrators must find something wrong. In my four years of teaching, I’ve never seen them fail." Garry's article is worth reading. Time.com has an article on The Myth About Homework. Claudia Wallis writes about studies which question the effectiveness of vast amounts of homework. A certain amount of homework does improve understanding, but more can be very destructive. All of these drive home our belief that homeschooling is a great options. Our children are not treated like inmates. If we are blessed with boys we won't make them feel like drop outs. And we can tailor the amount of homework to the individual and subject material. Sorta kinda the first day of "school"
Today, I watched the children walk past my house on the way to the neighborhood "government" school which is about 100 yards from my house. All my friends who have children in school (private or government), started today. I have an objection to the "school" year starting in August. It just seems wrong to me. I have such fond memories of summer vacation and school starting in the "fall." August is NOT the fall. It is still summer when children should be out running and playing. On the other hand, I'm glad that school has started. We will have the library to ourself again and other interesting places will have short lines during school hours. Having said all that, I told my kids we were sorta kinda starting school today. Basically, we did what we normally do during the summer. We started the day off with morning chores and family scripture study. The kids then practiced the piano. After that, the girls wrote in their journals. Of course, they read much of the day like they always do. We are a bit out of kilter because we have guests. I'm quite enjoying 7 kids in the house. I went grocery shopping with an 18 month old, which is something I haven't done in about 4 and 1/2 years. He was so cute in the shopping cart. Anyway, back to the point. To start our school year off with a "wimper," I had the girls take a test on kidtest.com. I'm planning on the girls taking the same test again at the end of the "school" year. That way I can compare the change. I'm not really a "testing" fan, but I like using it as a reference point. In addition, testing well is a skill that makes getting into college and getting scholarships easier. Also, testing well has a tendency to "shut up" homeschooling critics. I'm secure enough (really, really, I am) not to need such artifical reinforcement, but it doesn't hurt to have an ace up your sleeve, just in case. Grizzly Mama has another Friday Aesop Fable - The Frogs Asking for a King. As one who is very distrustful of government, I liked this fable. Continuing on from Part 1, Part 2, and Part 3. Of a 6 hour school day, an average of 3 hours or less are spent on actual instructional time. Taking Teaching & Learning Seriously (TTLS), an educational e-journal created by the EECE faculty and students of Kennesaw State University, reports that "50% of classroom time is lost due to student misbehavior and being off task." So, most students receive about an hour and a half of instructional time per day at school and only a few minutes per week of one on one instructional time from a teacher. "If experience, research, and common sense teach nothing else, they confirm the truism that people learn at different rates, and in different ways with different subjects. But we have put the cart before the horse: our schools and the people involved with them-students, parents, teachers, administrators, and staff-are captives of clock and calendar. The boundaries of student growth are defined by schedules for bells, buses, and vacations instead of standards for students and learning." "No matter how complex or simple the school subject-literature, shop, physics, gym, or algebra-the schedule assigns each an impartial national average of 51 minutes per class period, no matter how well or poorly students comprehend the material." "Secondary school graduation requirements are universally based on seat time-'Carnegie units,' a standard of measurement representing one credit for completion of a one-year course meeting daily." Thus students think they are entitled to a diploma because they have served their time, not because they have actually learned something. "Staff salary increases are typically tied to time-to seniority and the number of hours of graduate work completed." Yet again, rewards are based on time served not quality of service. "Despite the obsession with time, little attention is paid to how it is used: in 42 states examined by the Commission, only 41 percent of secondary school time must be spent on core academic subjects." "Decades of school improvement efforts have foundered on a fundamental design flaw, the assumption that learning can be doled out by the clock and defined by the calendar. Research confirms common sense. Some students take three to six times longer than others to learn the same thing. Yet students are caught in a time trap-processed on an assembly line scheduled to the minute. Our usage of time virtually assures the failure of many students. What of 'average' students? They get caught in the time trap as well. Conscientious teachers discover that the effort to motivate the most capable and help those in difficulty robs them of time for the rest of the class. Typical students are prisoners of time too." "The traditional school day, originally intended for core academic learning, must now fit in a whole set of requirements for what has been called 'the new work of the schools'-education about personal safety, consumer affairs, AIDS, conservation and energy, family life, driver's training-as well as traditional nonacademic activities, such as counseling, gym, study halls, homeroom, lunch and pep rallies. The school day, nominally six periods, is easily reduced at the secondary level to about three hours of time for core academic instruction." "Students in other post-industrial democracies receive twice as much instruction in core academic areas during high school." "Another distinction that can be drawn between American education and schooling abroad is in consequences for school performance. In Germany and Japan, learning matters. Performance, not seat time, is what counts. Students understand that what they learn in school will make a real difference to their chances in life. In the United States, paper credentials count. Apart from the small percentage of students interested in highly selective colleges and universities, most students understand that possession of even a mediocre high school diploma is enough to get them into some kind of college or job." The report was written to support the argument that we need longer school days and more school days. And, of course, that schools need more taxpayer money. While I agree with the data used in the report, I think they missed the point. Institutions are grossly ineffective at using time (and money). Basic literacy and math skills can be mastered in only a few years, yet we have students who have spent 13 years in the system who can't do either. Giving the school system more time, is like raising the credit limit to accommodate a shopping spree. Just as shopping with a credit card is spending someone else's money, lengthening the school day and year is spending someone else's time. With home based education, families control how their children's educational time is spent. The speed and level of instruction can be tailored to fit the needs of the child. For example, my daughters have benefited from a slower pace for reading instruction. Developmentally, they were not ready to read before age 8 or 9. Reading instruction before that developmental window was reached, would have been (and was) a waste of time. Once that developmental maturity was reached, the acquisition of reading skills took very little time and effort. Soon after my oldest daughter's 8th birthday, she began to read complex books entirely on her own. She literally went from NOT willingly reading Cat in the Hat, to plowing through Harry Potter and the Chamber of Secrets on her own. In 4th grade, I had her keep a reading log. I discovered that she was reading 60 chapter books a month. This is from a child that didn't read any books in the second grade. If we had focused on reading skills, like most of the school programs do, we would have been restricted to books which used short words, a limited vocabulary, short sentences and simple concepts. That would have been a waste of more than just time. Parents can educate their children more efficiently than the government school system. For parents who don't need the school system for "day care" purposes, homeschooling can provide the opportunity for a custom fit education that leaves time for the pursuit of other interests. See Reasons to Avoid Government Schools - Part 5. Spunky tagged me to answer a few homeschooling questions. The Well Trained Mind by Susan Wise Bauer was the first homeschool book we every read. We also enjoyed Home Educated and Now Adults by Brian D. Ray, Ph.D. The internet and specifically google.com. I don't know how people did research before. Saxon Phonics. I bought it used from someone who used only the first lesson. I did about 3 lessons and gave it away to someone at the park. Daily Grams Work books. They provide a short review of grammar concepts. Brain POP. Another homeschooler told me about it. They have cute little info segments and quizzes on just about any topic from math, science, social studies and language arts. Brain Pop has a free month trial and then it is something like $7 a month. Some foreign language program, if I could figure out which one to buy. Instant meals. Just add water and Viola! and it becomes a healthy, home cooked meal. I'm going to have to come back to this one. I have to find out who has already been tagged. We have guests and I haven't read any blogs for a few days or so. Milton Friedman proposed the idea of school vouchers back in the 1950s. He has long been known as one of the great economists of our time. He has made his "Free to Choose" PBS TV series available over the internet. This would be a great start for a teenager wanting to know more about economics. And it is free! Mark Forster shares some ideas on time management from his book Do It Tomorrow, which may only be available in the UK right now. His book looks promising. So far my favorite time management book is The 7 Habits of Highly Effective People by Stephen R. Covey. We did a few interviews earlier this year. (And I plan to do some more.) Lou Adler shares The Best Interview Question of All Time. His question is: "Please think about your most significant accomplishment. Now, could you tell me all about it?" He explains why this is such a powerful question. It was an interesting read. Nick Hornby explains in How to read that one of the most important aspects of reading is recognizing that it is OK not to finish a book. Growing up I was always taught to clean my plate or finish what you start, and so I've struggled at times with a book I wasn't enjoying. This was a good reminder. The Carnival of Homeschooling next week will be held at Category Five. As always submissions are due Monday at 6:00 PM PST. Go here for instructions on how to submit a post. Karen of The Thomas Institute is hosting the Roundhouse Roundup, a blog carnival on model trains. Entries are due before the 30th of August. Go here for instructions. And finally Unschooling Voices #3 will be coming out early in September. Joanne of A Day in our Lives is the host. This is a carnival focusing on unschooling. Entries are due before September 1st. Go here for instructions on submitting a post. The last panel on the Prickly City comic today is funny. Carrie Lukas makes some good points about the problems with preschool in A Universally Bad Idea. Also from the Goldwater Institute Matthew Ladner imagines how would Donald Trump evaluate public education in You're Fired! Have you ever wondered what the center of our galaxy looks like? We don't have good pictures because there is so much dust in the way. This is an amazing false-color representation. This beautiful nebula IC 410 is a hydrogen gas cloud of about 100 light-years across. This may be the site of ongoing star formation. I had to look twice before I could see North America in this picture of The North America and Pelican Nebulas. A friend of mine was recently down in Chile. Over the last couple decades Chile has experienced a dramatic economic boom. My friend said there was one down side. In the last couple years many people in Chile have become wealthy enough that they have started accumulating stuff. And it has gotten bad enough that many people are using storage units. It was an interesting thought. Maybe one of the ways to tell if a country has really become wealthy is when they start building storage units. As parents we can hurt children if we give our offspring everything they ask for. Children can learn valuable lessons in saving and waiting for a toy, a bike, or some game. They learn discipline and how to make choices. Just because we can afford something doesn't mean we need to buy it. There is wisdom in saving some of our money for a rainy day. If we teach our children to save and invest, then they will be ready when bad times hit. They'll have a cushion which allows a hard time to be something to be endured, rather than something which greatly harms them. This headline caught my eye. 'New York State, recently criticized for underestimating the number of unsafe schools it oversees, yesterday added 17 schools to the list of those considered “persistently dangerous,” including 11 city schools for special education students. States are required to compile yearly lists of “persistently dangerous” schools under the federal No Child Left Behind Law, and each state defines the term differently. Since New York started identifying such schools in 2003, various public officials have ridiculed the lists for their brevity: Until this year, only seven schools had been identified as “persistently dangerous,” and none were the “impact schools” that Mayor Michael R. Bloomberg had deemed particularly unruly. Those seven schools remain on the list. The criteria used to define “persistently dangerous” schools varies from state to state, and year to year. According to the New York State School Board Association, in 2003 "identification was based on having two consecutive years of a ratio of 3 percent or greater weapons incidents to enrollment." New York's EMSC (Office of Elementary, Middle, Secondary and Continuing Education) reports that the new criteria "is a ratio of violent incidents to enrollment in a school and is determined by the number of incidents involving the use or threatened use of weapons, homicide, serious sexual offenses, robbery, assaults resulting in serious physical injury, arson and kidnapping." I found this explanation of the designation process in a document for Philidelphia schools. In 2003, for a school to be designated "persistently dangerous," the school district must have reported more than 5 "dangerous incidents" per 250 students or a number that represented at least 2% of the school’s enrollment. A dangerous incident was defined as a weapons possession incident resulting in arrest (guns, knives, or other weapons) or a violent incident resulting in arrest (homicide, kidnapping, robbery, sexual offenses, and assaults) as reported on the Violence and Weapons Possession Report (PDE-360), which school districts file each year. The Philidelphia designation did not take into account incidents where there was no arrest made. California and the District of Columbia reported having no schools as "persistently dangerous." Having worked in down town Los Angeles and visited Washington, DC, I find that hard to believe. It calls into question the whole process, if each state or district can make up their own criteria. I can see the bumper sticker now: My child attends a Persistently Dangerous School! The Washington Post had an interesting opinion piece on college students' deficiencies in English. 'In our better private universities and flagship state schools today, it's hard to find a student who graduated from high school with much lower than a 3.5 GPA, and not uncommon to find students whose GPAs were 4.0 or higher. They somehow got these suspect grades without having read much. Or if they did read, they've given it up. And it shows -- in their writing and even in their conversation. A few years ago, I began keeping a list of everyday words that may as well have been potholes in exchanges with college students. It began with a fellow who was two months away from graduating from a well-respected Midwestern university. "And what was the impetus for that?" I asked as he finished a presentation. At the word "impetus" his head snapped sideways, as if by reflex. "The what?" he asked. I wouldn't have guessed that impetus was a 25-cent word. But I also wouldn't have guessed that "ramshackle" and "lucid" were exactly recondite, either. I've had to explain both. Here's some more words that made Professor Skube's list of words college students no longer understand: Advocate, Derelict, Satire, Pith, Brevity,and Novel. I'll admit that I didn't really know the definition of the word "pith" either, but I easily recognized the rest. These vocabulary challenged students acquire college degrees without actually getting a college level education. The same is true for today's high school graduates. Giving a student a piece of paper that says he has a college degree or high school diploma doesn't magically transfer the knowledge that that piece of paper used to represent. It doesn't make her successful. It merely perpetuates a fraud. "What we're graduating from our high schools isn't college material. Sometimes it isn't even good high school material." So why are we spending so much effort to make it look like students have an education when they, in fact, do not? I propose that one motive is that it makes people feel better. It is easier to give students grades and diplomas that they didn't earn than to admit some students will fail no matter what, the government school system is grossly ineffective, or that many students are just not college material.